On Graham Road in Malvern you’ll find an independent hotel called The Cotford Hotel set in beautiful gardens. The hotels L’Amuse Bouche restaurant is the place for fine dining. The multi award winning restaurant serves excellent cuisine which is produced using local sourced ingredients – some of which is grown in the gardens. The menu features creative dishes of fresh fish, seafood and meats which are all presented beautifully. In addition there is a bar and pleasant lounge area for pre or post dinner drinks. A must when you’re visiting Malvern. Originally built in 1851 as a summer residence for the Bishop of Worcester, this magnificent Victorian Gothic manor is in more recent times occupied by an award winning hotel and restaurant. Husband and wife Chris and Barbara Morgan have been custodians since 2007, and are responsible for transforming The Cotford Hotel into an opulent retreat set in the Malvern Hills – an area of outstanding natural beauty. Barbara’s love for interior design sprinkles a touch of style and luxury into the mix. The 15 guest rooms, restaurant and bar area have been thoughtfully refurbished, and her magic extends out into the beautifully landscaped gardens that surround the hotel. Chris heads up the kitchen cooking his French-style cuisine which has seen the hotel’s L’Amuse Bouche restaurant achieve and retain 2 AA Rosette awards every year since 2008. Craig Englefield joined Chris in the kitchen in 2012 and the duo are proud of their list of accolades which also include a place as ‘Worcestershire Restaurant of the Year’ in the Visit England awards 2016/17, as well as being recommended in the Michelin Guide in 2018/19. Hector the dog gives us a warm welcome on our arrival and we are escorted into the fabulously pink lounge area to enjoy an aperitif. The pink theme extends through to the restaurant which comfortably seats 38. On this particular Wednesday evening we were informed it is unusually quiet. This was great for us as my dining partner and I were looking forward to enjoying an intimate dinner in the dimly lit room surrounded by its plush furnishings. The service is respectful and friendly. We note the attention to detail and how each staff member knows precisely when to appear and disappear. Following the mackerel and beetroot amuse bouche, freshly baked bread accompanied with flavoured butter on a salt block is a fun introduction to the evening. 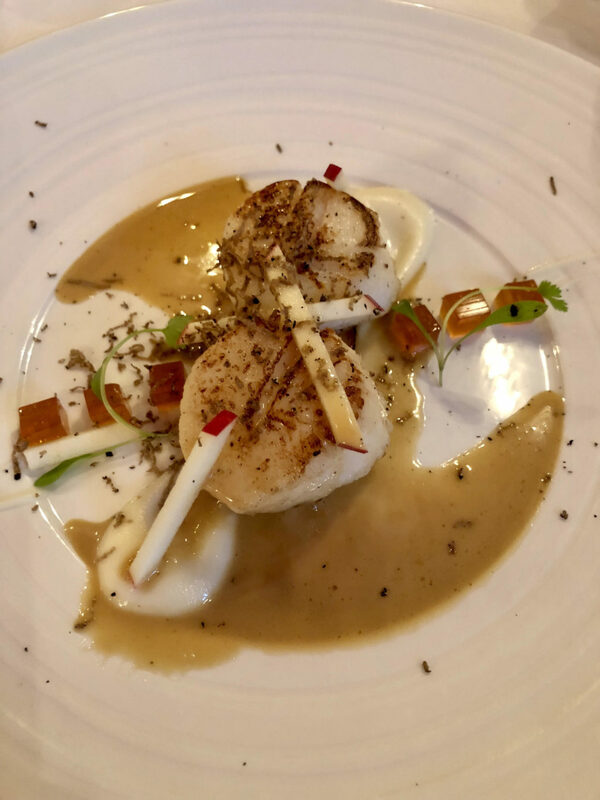 My starter of scallops (£10.95 sup £3) arrives and our server returns to complete the dish by grating over fresh black summer truffle. 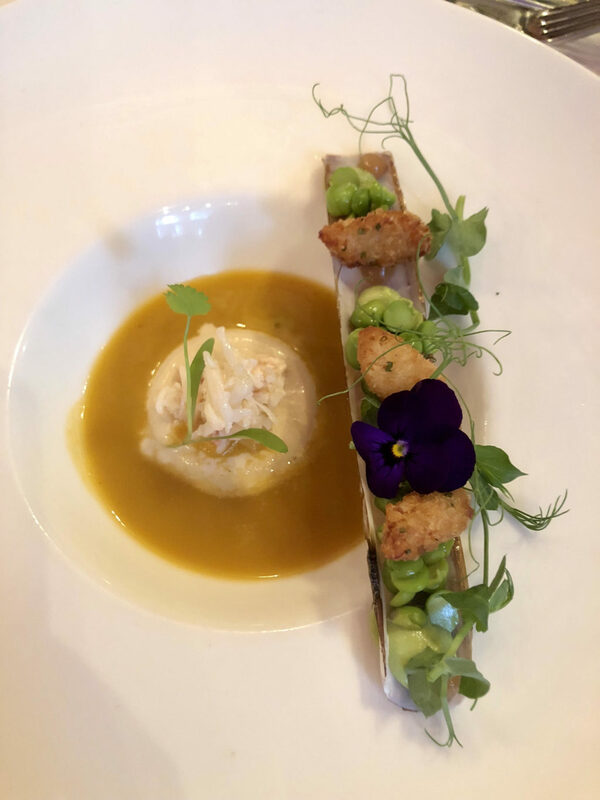 Across the table is a beautiful trio of Cornish Crab (£9.95 sup £3) sitting in a silky bisque with a bridge of crispy razor clams to complete the theatre of the dish. 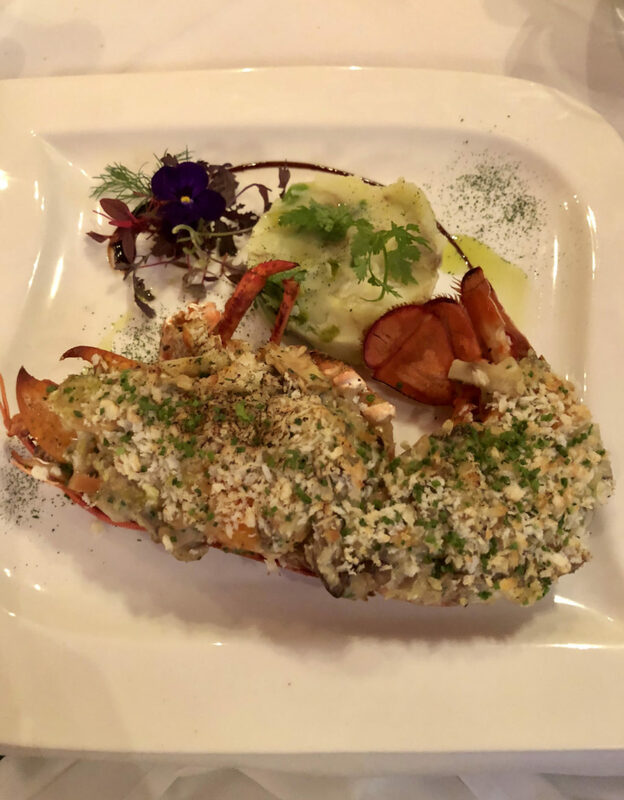 The exceptional cooking continues through to the main course and my decision to opt for the Cornish half Lobster (£24.50) is aided by the waitress who explained that I could have it served with a garlic crumb Instead of the listed Thermidor style. 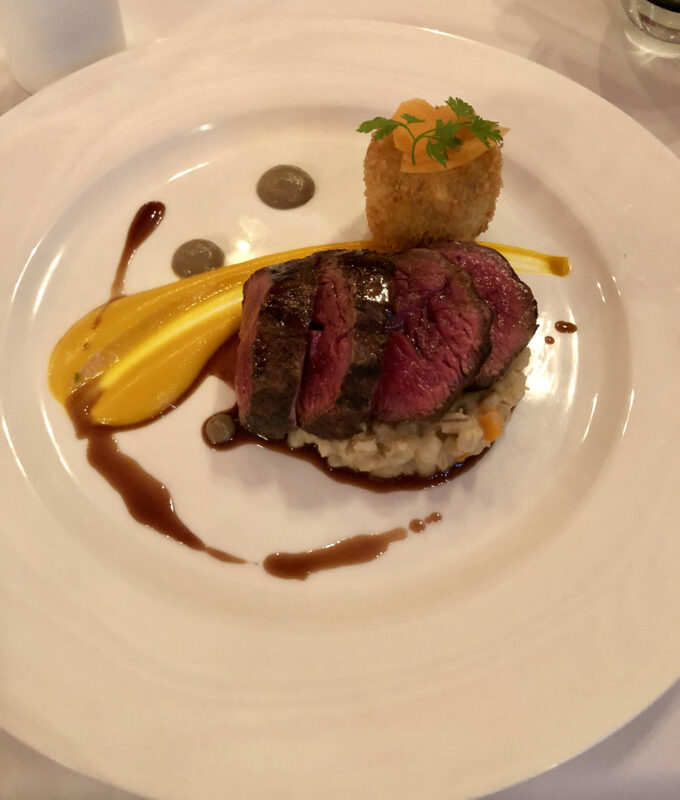 A fillet of local Hereford beef (£26.95 sup £6) is a splendid choice for my dining partner who appreciated the quality and the meticulous cooking of the meat. 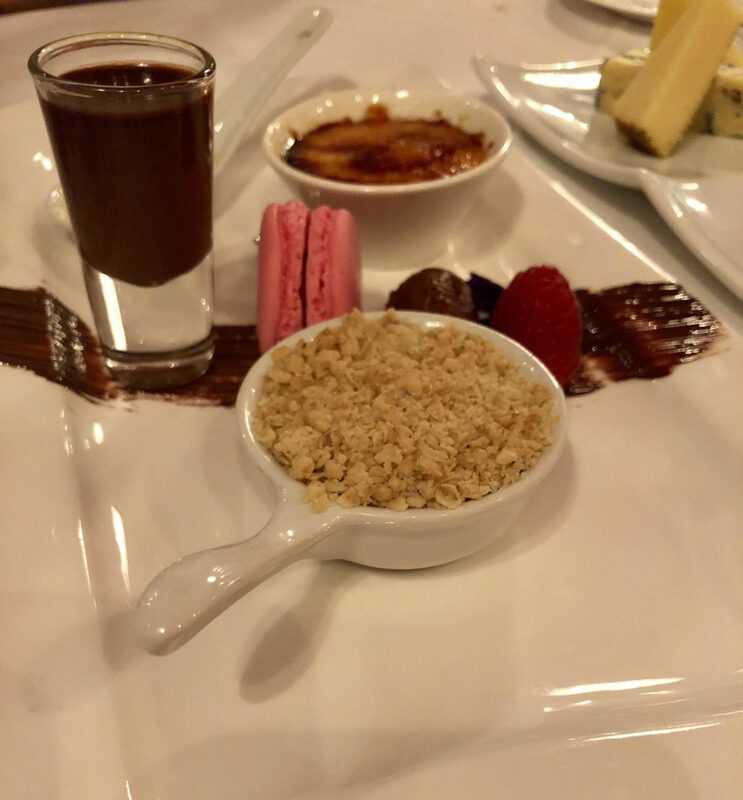 An assiette of miniature desserts followed (£8.75) with our favourites being the lemon meringue, rhubarb & gin chocolate mousse and the terrific macaroons. We then finished with the L’amuse Bouche cheese board (£11.75 sup £3). With time to reflect on the superb meal we had eaten we retired back through the lounge area before meeting the chefs and enjoying a nose into the remarkably spotless kitchen where everything has its place. Chris Morgan explained that Craig has recently been appointed head chef, although they work together on new creations, allowing for an interesting combination of more traditional cooking styles that have a modern twist. There is a passion for supporting local suppliers and using the best quality ingredients, as well as utilising the seasonal fruit, edible flowers and herbs growing in their own gardens. Chris revealed that the restaurant is aiming to achieve its third AA rosette and with the level of care and passion for excellence at The Cotford Hotel, this is a very realistic ambition for the team here, who are essentially one big family. The Foodie Card offer – Enjoy 10% off Afternoon Tea / 10% off al a carte menu Sun-Thurs evening (food only & max table of 4 per booking). The Foodie Card gives you access to offers at your local food & drink independents. Grab your card here for £15 (or two for £25) for year long savings whilst supporting local!